BOOK LAUNCH POWERED BY LOVE: A Grandmothers' Movement To End Aids In Africa. by Joanna Henry with Ilana Landsberg-Lewis. Photographs Alexis MacDonald. Goose Lane, 2017. 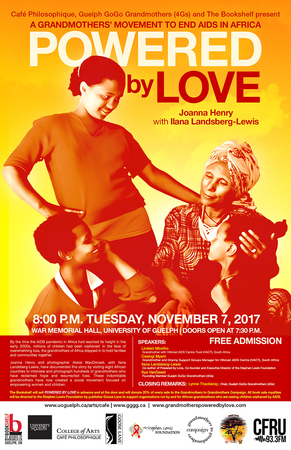 On Tuesday, Nov 7, 2017 at 7:30 pm, doors opened on War Memorial Hall, University of Guelph, anticipating the remarkable stories of the indomitable African grandmothers, as documneted in the book. These African gogos have held families and communities together in the face of overwhelming loss. 4Gs is just one of a global solidarity movement of grandmothers they inspire to raise awareness and funds to support their grassroot work. in collaboration with Guelph GoGo Grandmothers (4Gs) and The Bookshelf. The Current (CBC Radio, Nov 23) "Grandmothers in Africa Fight for an AIDS Free Future"